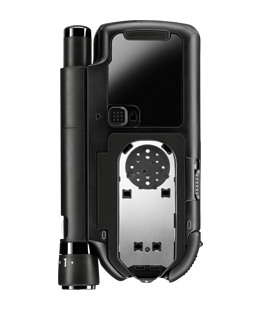 Get connected to the smart world of mySugr with the new Accu-Chek Mobile wireless adapter. Because you are going places, sometimes you need to test discreetly. Fuss-free, without having to explain yourself. A quick test is key. Because you need to get behind the wheel, testing needs to be fast and easy. Stay safe, keep your license and be in control. Seems like too much hassle? Because you've got people to see and places to go, sometimes you need to test discreetly. Meet and mingle without the bother. Because you've got hills to climb, you want better control. Find what works for you, and get results. Because you've got things to do, you need to test quickly and easily. And then get back to the things you love. 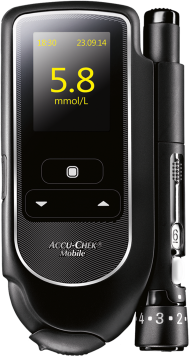 Unlike conventional blood glucose monitoring systems, Accu-Chek Mobile uses strip free technology. No more awkward moments with individual test strips or separate lancets, the Accu-Chek Mobile system uses a cassette containing 50 tests and the integrated finger pricker takes a user-friendly drum containing 6 lancets. Alan doesn't let his diabetes stop him doing anything. He uses the Accu-Chek Mobile to test while he's out and about and says "The Accu-Chek Mobile for when you're driving is absolutely superb..."
Andrea has a busy lifestyle. She has recently moved house and returned to work from maternity leave. She says with the Accu-Chek Mobile "it's easy to check my blood sugar without strips which is a huge..."
Ben is an active person with a busy lifestyle. He says "I'm using the Accu-Chek Mobile purely because it's just so easy to use." Ann enjoys activities such as walking, Zumba and Pilates and thinks Accu-Chek Mobile "is just so convenient to carry around and it's very discreet." For more detailed instructions and training videos, please visit the Accu-Chek Mobile product support page. Reminders: Up to 7 standard, individually programmable reminders that are repeated daily, plus up to 3 once only reminders which can be set to occur 1, 1.5, 2, or 3 hours after a test. Order free batteries, record books and other supplies for your meter here. Download user manuals, watch product training videos and read FAQs here. Already an Accu-Chek Mobile owner? Register your product here. 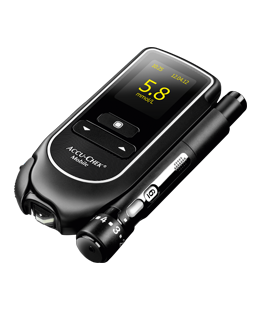 Find out which Accu-Chek blood glucose meter will suit you best. Independently tested against current International accuracy standards (ISO 15197:2013) and found to exceed these performance requirements. Freckmann et al, journal of Diabetes Science and Technology, Sept 2012. Maran A et al. : Use of an integrated strip-free blood glucose monitoring system increases frequency of self-monitoring and improves glycemic control: Results from the ExAct study. Journal of Clinical and Translational Endocrinology (2014). DOI: 10.1016/j.jcte..2014.08.003. ACCU-CHEK, ACCU-CHEK MOBILE, FASTCLIX and MYSUGR are trademarks of Roche. The Bluetooth® word mark and logos are registered trademarks owned by Bluetooth SIG, Inc. and any use of such marks by Roche is under license. All other product names and trademarks are property of their respective owners.